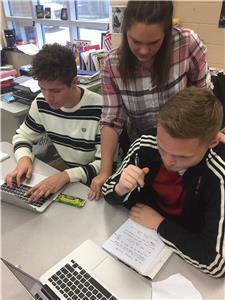 Some Ooltewah High School students are teaming up with The Johnson Group for an amazing opportunity— They are going to help re-brand Hamilton County Schools. Together they will be doing everything from redesigning a logo to organizing public service and promotional events. Using what the students have learned in class, they will be collaborating with The Johnson Group to develop a brand new marketing campaign. “It’s one thing to learn from the book, but how do you really learn and prepare for the world of Marketing? Teaming up with professionals that work in the field and can offer their expertise to students,” said classmate Jake Page. This partnership allows the students to receive a one-of-a-kind dynamic learning experience and to tear up the playbook of traditional education and replace it with a more innovative approach to learning. “The Advanced Marketing Class is not your typical class. It offers a dynamic learning experience focusing on collaboration with the Johnson Group and many other Chattanooga businesses, giving us that marketing knowledge we desire,” said OHS student Kylan Whitt. Dr. Johnson is excited about the potential he sees in this type of student-business partnership. “I believe [Ms. McIntyre] has some great thoughts on ways to engage her students in this effort,” she said. Look for the efforts of The Johnson Group and OHS collaboration later this school year. The Johnson Group is offering its services to HCDE at no charge.